The president claims the American people don’t care about his tax returns. Wrong. Might as well invest in that new pair of sneakers. The national farce that is Trump’s plan of action shows no sign of stopping, and neither do the protests. This Saturday, April 15—tax day—is the Trump Tax Returns March. So, as the past few months have demonstrated, the most visible way to assert that we do in fact care about the shady stuff Trump is doing, is to gather en masse an yell about it in public. 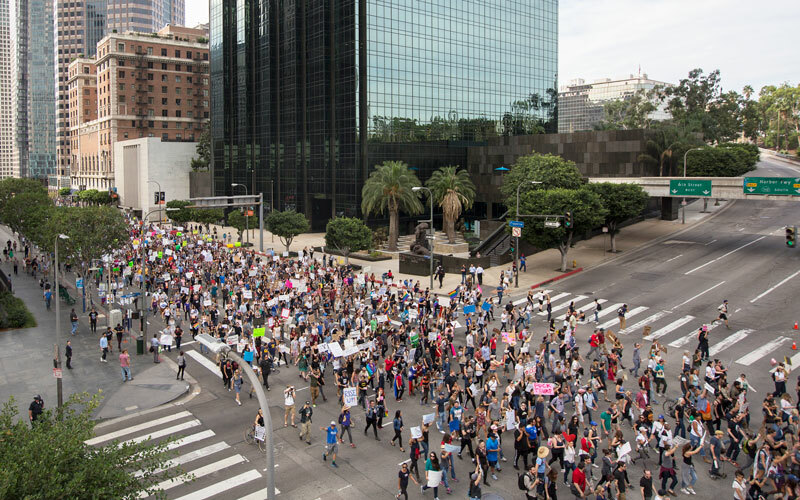 The march is planned for at least 63 U.S. cities, including Los Angeles, where it will begin in Pershing Square downtown at 11 a.m. and progress to city hall. The lineup of speakers includes precious, precious Ted Lieu. There will be a giant inflatable Donald Trump chicken, because, you know, he’s a chicken for not showing us his tax returns. Currently the local march is at 22,000 RSVPS, with 50,000 “interested”—which, you might notice, is more than any other city. Sorry, we get a little competitive.